1. Adjustability: 0°-30° adjustment for ulnar deviation (wrist splay) in the horizontal plan, combined with 0°-30° adjustment for wrist pronation (vertical tenting). 2. 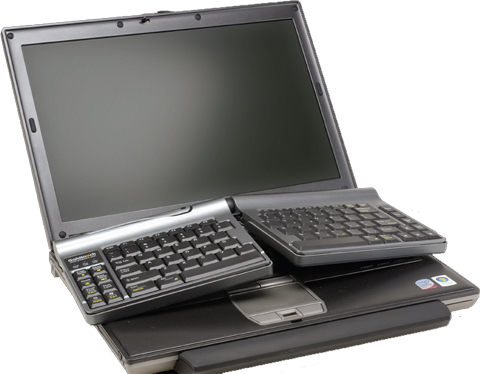 Protective Removable Covers: Allows the keyboard to beplaced on the notebook. 3. Soft key touch, low activation force and full key travel distance provides keying comfort and reduces risk from “bottoming out” when keying. 4. Compact size allows for use in limited space environments, and reduces shoulder abduction when reaching for mice and other peripherals. 5. Ease of use and intuitive design allow new users to adjust the keyboard to a comfortable typing position without additional accessories or attachments. 6. Compatible with Windows 2000, XP, Vista and Mac. Offering all the comfort and functionality of the standard Goldtouch keyboard, but in a sleeker and lightweight form factor, the Goldtouch Go! Travel Keyboard is the ONLY compact keyboard that reduces or eliminates risk factors that lead to injury. At a mere 1.5lbs, the Go! Travel Keyboard allows road warriors and mobile professionals to safely work wherever their jobs take them, and, enjoy all the benefits of the standard Goldtouch when away from their office workstations. Adding to the historical durability and ruggedness of the standard Goldtouch, the Go! Comes with two protective covers that support the Go! During use while reducing exposure to impacts that could lead to key loss when traveling.